This facsimile edition of a paper by E. R. Calthrop was published on the Hundredth Anniversary of its first publication, in 1897. In it, Calthrop, who was Engineer to the 2ft 6in gauge Barsi Light Railway in India, sets out the general principles of narrow-gauge construction and operation. 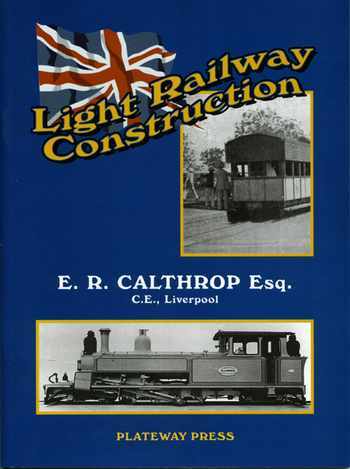 Building on his experience on the Basri Railway, Calthrop went on to create the Leek and Manifold Light Railway, one of the few commercial applications of the 2ft 6in gauge in Britain and the only common carrier railway to use transporter wagons. This paper, published in permanent form for the first time, gives a valuable insight into the theories of its creator, and acts as a valuable additions to the published data on narrow gauge and Light Railway design and construction. Softback, laminated cover, 17 black and white photographs, 15 maps and drawings.